The use of Scripture in 1 Peter has been subject to much extensive analysis in the last thirty years. 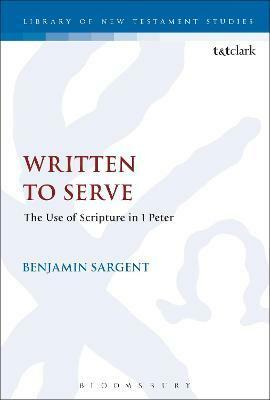 In Written to Serve Benjamin Sargent offers an up to date and comprehensive analysis of how 1 Pet 1.10-12 offers a `hermeneutic,' providing an insight into how Scripture is interpreted in the letter. Sargent also argues that the relation of 1.10-12 has been misunderstood. Rather than offering a Christological hermeneutic with a focus on the suffering and glories of Christ, Sargent asserts that the primary importance of 1.10-12 is its orientation of the prophetic witness towards the eschatological community as an act of service. Similarly, rather than offering a theological narrative of continuity between Israel and Christian communities, 1.10-12 may be seen to suggest a narrative of profound discontinuity in which the community in the present is elevated above God's people of the past. Chapter 1. 1 Peter 1.10-12: An Hermeneutical Statement? Benjamin Sargent is Vicar of Bransgore and Hinton Admiral, Hampshire, UK.